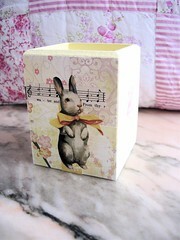 Finally opened the shop yesterday and two hours later I sold my first article: the rabbit-pencilbox. I am so glad it goes to Steph to Australia because it was hard for me to part with it. So now I know it will be in good hands.